For a complete list of Rich’s upcoming bookstore signing events, click here! You too can have a published author come and give a presentation to your store, club or class! Since Jaspa’s Journey: The Great Migration was first published, Rich has done over 200 author appearances. 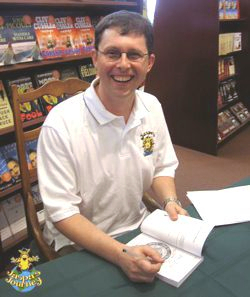 He loves talking to his readers, whether at literary festivals or in bookstores, school classes, cub scout packs or Optimists clubs. And your group could be next! In a tailored presentation lasting up to an hour, Rich will introduce you to the Serengeti, the Great Migration, the Ses, my adventures... and he’ll even read excerpts from Jaspa’s Journey, of course. He’ll also give you an author’s eye view of what it’s like to write a book and get it published, plus an insight into the life of an environmental scientist. If you’re interested in arranging an author appearance, just send me an e-mail and I’ll pass it on to Rich.